This is the biggest cliff on the mountain, rising over two hundred metres straight up from the valley below. Due to its remote location, few people have ventured to the west side. The crag is located at 1800m above sea level at its base and is gained by ascending the alpine meadow above Kahui Hut. The hut provides accommodation for six people and is at approximately 880m altitude. From the hut, the track heads straight up through bush and scrub to Black Rock and then on up the alpine meadow. 2–3 hours. Descent from the top of the crag is along a ledge towards the Summit and into the valley. Care should be exercised when crossing any old snow in the valley. Start approximately 20m to the right of the prominent corner. Angle up over some large obelisk type blocks and move to the left to intersect with the lower ledge and the arête. Follow the arête to a small belay ledge on the north face. Continue up the arête until it opens out to form a series of mossy steps over large blocks. Sidle right around a rock overlooking the west face. Belay under a large rock overhang. Climb over the large rock overhang to reach the gentle moss slopes above. Move without the rope to gain the top rocks some 200m above the valley. Ross Eden, Kevin Conaglen (alt. ), 07/02/98. Russell Braddock, Pete Boomen, c. 1976. Chris Hill, G Herbert, 04/97. 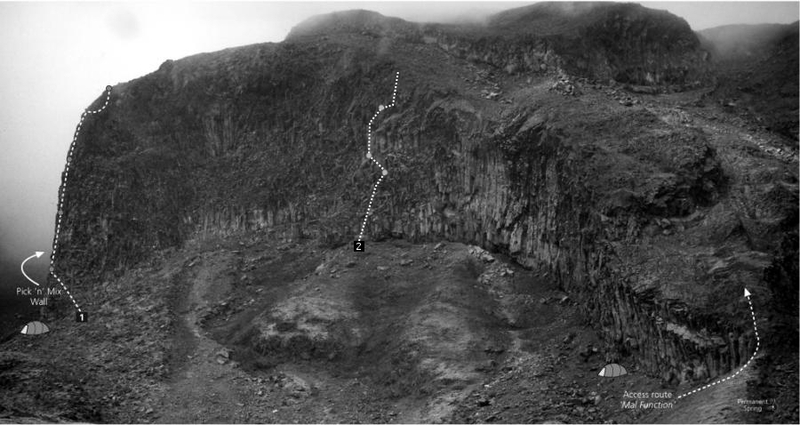 The route goes up the middle of the main wall and starts up low angle slabs between two shallow caves, directly beneath the long fist crack on the upper headwall. Descent: An easy but exposed traverse out to the right leads to the first scree field (Bluffed out). Cross the low ridge to the second scree field and descend the steep gully/gorge on the far end which spits you out at the south side of Okahu Bluff. Descent is best done at night with one head torch between 4. A reachy move gets you off the slabs and established on the lower headwall (Crux). Blast up through the easy crack and ledge system until you reach the belay ledge right below an overhanging groove which grants you access to the ledge under the fist crack. Climb the overhanging groove to the ledge above. You are now beneath the imposing widening hand crack, which once thorougly de-mossed will most likely be a classic line. Until then, be sensible and traverse out left to the party ledge with large boulders and climb up the short hand crack directly above the large sharp flake, do not fall. Arange a belay on the mossy sloping ledge. A fine pitch! Climb up the chimney with twin grooves, past the pile of chock-stones and aid the overhanging finger crack which would probably go free at about 24. Finish up the runout but easy slabs to arrange a semi-hanging belay in one of the cracks. Climb out to the right (Crux) and follow the line of least resistance up the gradually less steep upper headwall until you can sling a large boulder to arrange a belay. Scramble through blocky grade 13 terrain with the odd grade 16-17 move. Head towards the squeeze chimney. Crux is getting up to the belay. Awesome and well protected squeeze chimney followed by delicate face moves over a bomber nut placement (crux). Sigh with relief and boost to the top through low angle blocky terrain.